Welcome to our first edition of Dreamtime! Dream yard is a new site, started in May 2011. It came about from my search for that “one great site”, that would allow me to upgrade my skills and knowledge in the landscaping industry. Although there are some great sites out there, I could not find “it”. Most of the information was out there, but it was scattered around the internet on many different sites. I also found that much of the information was not always suitable for the climate, or native materials I worked with. So we decided to build "it", with a focus on helping homeowners, no matter where in the world they were from. Working from experience, and many hours of research and cross referencing, we are now well on our way to providing homeowners with the most educational landscaping site on the internet. With so many different aspects of landscaping to cover, we focused on the most popular how-to projects first. Material is being added frequently and we are glad you have subscribed to our newsletter. With it being winter in many parts of the world, we felt that a February newsletter would be a great time to discuss “Winterscaping”. Even though Spring may be just around the corner for many of you, this is a great time to make plans for next winter in your yard. Winterscaping is designing and adding features to be enjoyed through the winter months. Many of us don't actually consider what our yards will look like through the winter season. Winter can be bleak, dismal, brown, drab, dull and lifeless for 6 to 8 months in some climates. This makes winterscaping a much overlooked aspect of landscape design. Even under a blanket of snow, shapes can create interest in your yard. In most cases we design our yards to look good for spring and summer, with little or no thought for winter and fall. I often wonder if our winters drag out longer while we look at these lifeless yards? 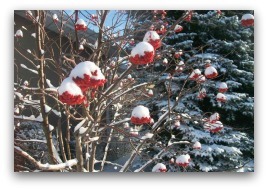 Winterscaping can create more interest in your yard, so you will enjoy the season that much more. There are many features that can add year round interest, or colour to your yard to change this. Trees, shrubs, plants, brick/stone walls, ornamental grasses, benches and other structures all make great winter features. How you use them effectively in winterscaping, can be affected by a few basics of design. Landscape designers understand, and use the basic elements of design in their daily routine. This is why their landscapes have appeal year round. Homeowners usually have a natural eye for these elements, but are not quite as familiar with the terms. If you did a search on basic elements of landscape design, you will find the number is not always the same. Some sites may say five, while others say seven. The number is not as important as understanding how they can help you with your own projects. We are just going to review a few elements and terms that will help you achieve more success. Line, rhythm, colour, balance, proportion, simplicity, unity and focal points are all good terms to know when considering your winterscape. Lines can be found with retaining walls, walkways, hedges, tree lines and garden beds. These features can add some life to your yard even buried under snow. Repeating patterns of shrubs at measured intervals follow the basic design principle of rhythm. They can also add some interest in the winter, as the poke through the snow. Adding spruce and evergreen will give you year round colour, while ornamental grasses provide a nice contrast in the mix. Using summer planters for winter arrangements can also provide valuable colour. Spruce, evergreen and pine, can be mixed with branches of birch or dogwood. Red ribbons tied to the branches will liven them up for the Christmas season. Balance and proportion often work together to keep any one feature from overpowering the rest of the design. A good balance of shrubs and trees, will really stand out when the smaller plants are buried under snow. 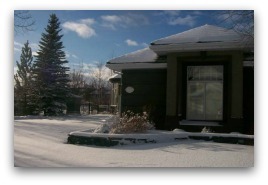 Taking a few pictures of your yard in the winter, will help you to see what you are missing for a great year round yard. Trees can provide you with cooling shade in the summer, and warmth in the winter by letting sunlight through when the leaves have dropped. This means that choosing the right trees for the location, can also help with your winter heating costs. The colour of tree bark and berries, are simple little things that can also have attractive winter qualities. We left simplicity and unity until the end to summarize the design terms. Keep things simple so you don't complicate your design. It's better for beginners to start out with a simple design that they can add to, than have a cluttered yard. When you put all these basic fundamentals of design together, you end up with a nice unity and flow. This is the ultimate end goal that will set your yard apart through all seasons. Structures can be purely practical, or used to compliment your design. Walkways, paths, bridges, patios, gazebos, arbours, bird baths, fountains, benches, retaining and decorative walls are all examples of structures. There are many more to list, but these are a few of the more common ones. Some of these can become great winter features in your yard. Taller structures like arbours and and gazebos, can be winterscaped with boughs of spruce for the winter season. Tying ribbons to the boughs, gives a nice added touch. Hanging basket arrangements from these structures can also dreass up your yard. Fountains and bird baths become sculptures in the low sun as they cast long shadows across the yard. They also attract singing birds and other wildlife that leave small footprints in the snow. Benches and bridges covered with a fresh snowfall also make for a pleasant winter scene. Retaining walls made of brick and stone should also be considered for winterscaping. They can be visible features all year long, depending on the height and amount of snow. These can create interest in the yard by providing nice lines and contour. Consider the shape your winterscape will present when the foliage on the perennials and annuals are gone. This can make pruning skills a great asset for your yards appearance throughout the winter months. We mentioned how a lower sun casts longer and more prominent shadows in the winter, consider this with trees, shrubs, and structures. Evergreen shrubs, perennials, and small weeping trees can provide some interesting shapes in a winterscape. This was covered when we talked about designing elements. Make sure you have the right balance and rhythm to achieve a good design. We try to mention this in all our how-to planning stage sections for do-it-yourselfers. It's really important to have a practical and functional design for winter. Front walkways are hard to shovel if built out of flagstone, gravel, or decorative rocks. Choose the right plants and edging for the side of your driveway as well. Decorative rocks work well here, as the grass can experience winter kill from heavy snow, ice, and salt. Always use the proper fertilizer at the right time, and do a good fall cleaning in your yard before the snow falls. Rake the leaves, dead plants, and other garbage to keep a clean yard. These are all important factors in winterscaping. They can also help your lawn recover quickly in the spring with better growth. If you have to look at a winterscape longer than a summerscape, you might as well have the best possible one that you can. Before we head into the spring, have a look at your yard now, and take pictures if you must. You should always be a season or two ahead when it comes to planning in your yard. Photo Gallery of Winter Landscape Ideas, here you will find some great year round inspiration for your landscape designs. Estimating Landscaping Materials this article is packed full of great information on estimating and planning your various projects. If you are not familiar with our site, we have also started a picture ideas section that is growing every week. We are looking for submissions from both professionals and homeowners that wish to showcase their work. For those of you with websites, we provide a link to your site to credit you with the work. For those of you interested in displaying your pictures, please feel free to contact us. Submissions are always welcome for our newsletter, and will always be credited to the author. Requests for articles, how-to projects you would like to see, or any other recommendations are always welcome. Our goal is to be the most informative, and educational landscaping site on the internet. This will give homeowners the resources they need to build their very own dream yard. Dream-yard would love to hear what you have to say about the information you just read! Please leave us a comment in the box below.